I find this book incredibly inspiring. Many thanks to Amelie’s Bookshelf for the recommendation. I went out and bought it and used it for my final week of library classes. I read it to students in grades 1-5. 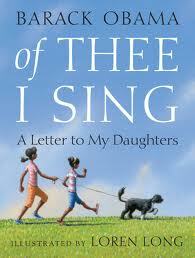 President Obama’s book is a letter to his daughters about the people that made our country wonderful. He starts, by saying, “Have I told you that you’re creative?” and then talks about Georgia O’Keefe. Each page, he talks about a quality exemplified by the person he highlights, including Helen Keller, Cesar Chavez, Neil Armstrong, Jackie Robinson, Martin Luther King, Jane Addams, Abraham Lincoln, Maya Lin, Sitting Bull and others. Some people, like Georgia O’Keefe, Maya Lin, Jane Addams and Helen Keller were less familiar to my students. It was nice to have the opportunity to talk about these amazing people and the importance of their work. Most importantly, President Obama finishes the book by saying that America is full of people of all different races, religions and ideas. This book is a beautiful, touching book. It’s especially great to share. The illustrations by Loren Long are wonderful. My students quietly while I read the book to them (good quiet, not bored quiet). Afterward, we went from student to student and talked about which person or people inspired them the most. I loved hearing students talk about the people that inspired them, particularly when they mentioned people they’d first learned about in the book. I can’t believe I haven’t read Bone until now. This is an embarrassing thing to admit as a children’s librarian, because Bone may be the most popular set of books in my library. I usually invest my time reading books that I feel won’t circulate unless I “sell” them to my students. This series definitely does NOT need selling. It is a perennial favorite in my library with students from 2nd to 6th grade. 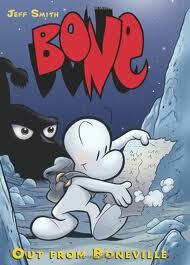 Phoney Bone is the richest Bone in Boneville. Unfortunately, he’s also a swindler who has cheated the townspeople left, right and backwards. When he is run out of town, his two cousins, Fone Bone and Smiley Bone, help save him. Fone Bone is kind, polite and resourceful. Smiley Bone is funny and not the brightest Bone in the bunch. Escaping with only one backpack full of prized possessions but no food or water, the three cousins wander in the desert. Attacked by locusts, they run, only to be split up from one another. Fone ends up crossing a mountain pass and finds himself in a valley, containing terrible rat creatures, a friendly red dragon, a possum family and a nice girl named Thorn and her grandma who take him in. Fone finally finds Phoney Bone, who is a disaster when it comes to manners. Fone Bone and Phoney Bone set out together to find the still missing Smiley Bone. I love the wit and the dialog in this very funny book. The characters, particularly the “not terribly smart” rat monsters and the wry red dragon with “Seuss-like” fluffy ears are absolutely great. I can definitely see why these books are so popular and why any elementary school library needs a set of these books. I think any child, second grade and up would enjoy the series, but that the students will understand more of the author’s wit if they are in fourth grade or older. There are eleven books in the original Bone series, counting the prequel, Rose, and Tall tales. The author also wrote another series called Quest for Spark. Don’t miss them! The first of the Big Nate series, my students recommended that I read this book. I’m glad I did! It’s perfect for fans of the Diary of a Wimpy Kid series. 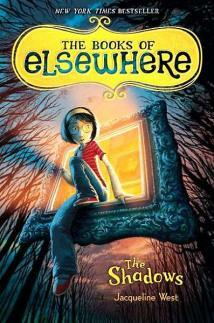 Like the Diary of a Wimpy Kid series, it’s funny and is a blend of graphic novel and text. This series is really popular with boys from 4th-6th grade who are always lobbying for me to get more books in the series…anything to keep them reading! 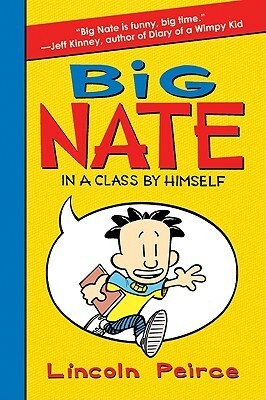 Big Nate (COMIX!) is also now a graphic novel series, so Big Nate flies off the shelves in my fiction and my graphic novel sections. Highly recommended for tween boy readers who like to laugh. Here’s an oldie but goodie that I found on the shelves of my library. It can be easy to dismiss books, because they aren’t current. In this case, you would miss a wonderful story. The dedication, “To those of us who have ever been lost or lonely” is touching. This book really moved my students and led to great discussions about the value of friendship. The once was a painter who was very poor. He had one favorite painting of a strange and wonderful bird. Then, a wealthy man comes and wants to buy the painting. The painter does not want to sell his favorite painting. When the wealthy gentleman offers more and more money, the painter, who needs money desperately, accepts the money and sells his painting. The wealthy man hangs the bird painting in his fancy house. The bird, who is magical, misses the painter and flies out of the painting. The bird begins a long search for the painter. In the meanwhile, the wealthy man goes to the painter’s house demanding his money back, because the bird left his painting. Now, the painter has no bird and no money. At last, the bird finds its way back to the painter, and the painter promises never to sell the bird painting again. 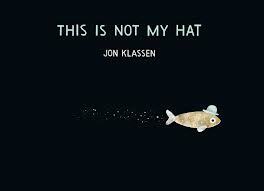 Here is another fabulous picture book by Jon Klassen, the author of the very the very funny I Want My Hat Back. I love the dark, dry humor in this and I Want My Hat Back. A little fish has taken a very big fishes’ hat. He swims confidently to the place where the plants grow big and tall and close together. He is sure that the big fish will not know where he is and that the crab that saw him swim by will not tell the big fish where to find him. Oops. This book has great pacing and is perfect for my “too old for picture books” students. They love it as do I.
I love Dan Gutman’s My Weird School series for younger readers, because it is so irreverent. Kids say things in the books that they would actually say to each other, instead of the more “pc” things they say around their parents and teachers. I think that’s what makes the series so successful with its 2nd and 3rd grade fans. Well, here is the series for older readers – the same snarky, irreverent humor that so appeals to kids with My Weird School, appears in Jim Benton’s Dear Dumb Diary, a real favorite with my 4th-6th graders looking for a funny book. This series tends to be read more by girls. 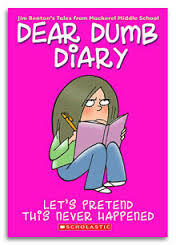 In her note at the beginning of her “dumb” diary, Jamie Kelly writes, “Dear Whoever is Reading My Dumb Diary, Are you sure you’re supposed to be reading somebody else’s diary? …If you are my parents, then YES, I know that I am not allowed to call people idiots and fools and goons and halfwits and pinheads and all that, but this is a diary and I didn’t actually “call” them anything. I wrote it. And if you punish me for it, then I will know that you read my diary, which I amnot giving you permission to do.” So begins Jamie’s diary and her hatred of “perfect” Angeline, a kid named Mike Pinsetti who has the power to create embarrassing nicknames, and her search to help her good friend Isabelle pick a new “signature” lip gloss. Ok, the series is NOT deep; but, it is really funny. This series flies off my shelves with its fans reading every book in the series.